The Delaware Veterans Coalition’s goal is to keep our website current as a source of information on benefits, opportunities, and events for our readers. Check back often. Please note you can sign up for a free update on veteran-related legislation by clicking on the newsletter registration link on the right. You can also submit an application for membership on the left. Membership is open to all honorably-discharged veterans residing in Delaware at only $20 per year. We meet every other month on the 4th Monday of the month, beginning in January of each year. We also support the Kent County Veterans Memorial Park which tributes Gold Star Mother and Families, those lost in Vietnam, Korea, and the Middle East. The park also contains a POW/MIA Chair of Honor, a War Dog memorial and a UH-1 “Huey” Dustoff helicopter perched on an 18-foot stand. 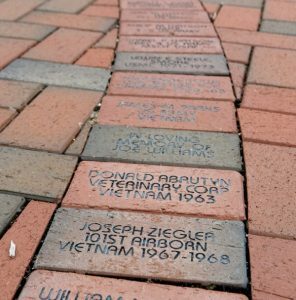 The park is financed through the sale of memorial bricks. If you wish to honor a family member or loved one who served, buy a brick to support the memorials, visit the Support the Memorials page. Rick Hoffman, Sam Cannan, Rick Aubin, Gale Newton and Lois Heesters. Not pictured, Dave Skocik. 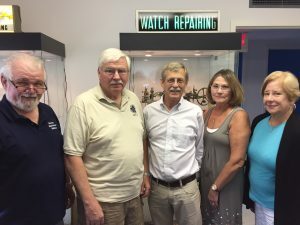 ODESSA – Rick Aubin, a watchmaker from New York has retired to Delaware to be with family and to train veterans in his highly specialized skill at the Veterans Watchmaker Initiative in Odessa. Training of the first six students from Delaware and several other states will begin after a ribbon cutting ceremony on Wednesday, September 13, at 10 a.m., according to school founder Sam Cannan, a master watchmaker who trained in Switzerland. Mr. Cannan, a former Baltimore police officer, moved to Kitts Hummock nine years ago. Since then he has spent a great deal of time working to establish a facility to train disabled military veterans, whose unemployment rate is a dismal 82 percent. Mr. Aubin, a veteran of the Vermont Air National Guard, trained at the Joseph Bulova School of Watchmaking in 1971 in Queens, NY, which eventually closed as a result of the advent of quartz watch technology in the 1970s and 80s. Since then, however, mechanical watches have been enjoying a world-wide resurgence and new professionals are urgently needed. The Veterans Watchmaker Initiative, unique in the nation, will help fill that need by training disabled veterans. Mr. Aubin’s more than 4 decades as a watchmaker includes work for an uncle’s jewelry store until the uncle retired and independent work for numerous stores throughout New England until his wife’s career led him to New York and additional training at Rolex, Omega, and Cartier. The Odessa location is the forerunner of a planned school in Middletown, Del., that will accommodate as many as 25 students. “Disabled veterans will be housed, fed and trained at no cost to them. That’s the least we can do for those who gave so much,” said Mr. Cannan. Contributions are tax deductible. Visit www.veteranswatchmakerinitiative.org or call 302-465-2421 for more information. 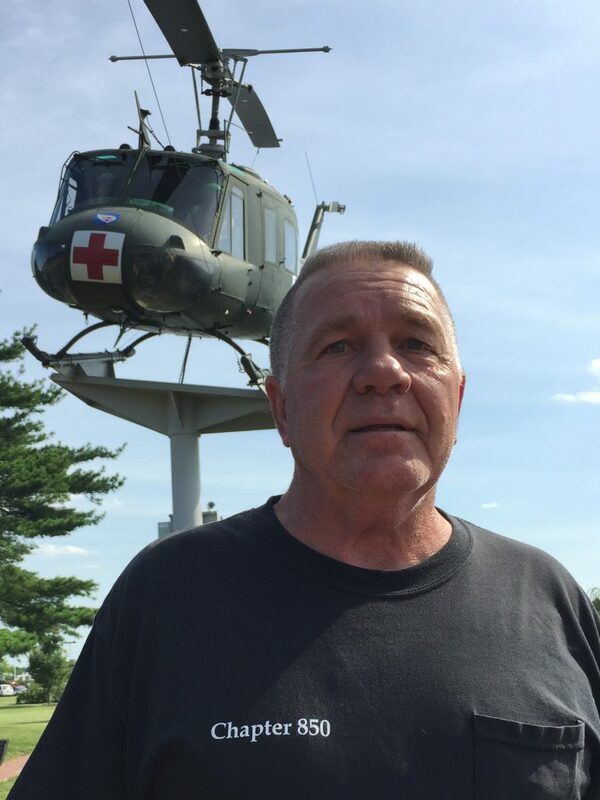 Joe Startt Jr, in front of a Dustoff Huey helicopter bearing the 45th Medical Company patch similar to the one that saved his life in Vietnam. Photo by Dave Skocik. The $35 plated dinner will be open to the public on a first-come first-served basis. The cutoff date is September 15. “Sponsorships are also available to help with the costs of honoring these heroes,” said Paul Davis, VVA State Council president. For tickets or sponsorship opportunities, call 302-697-8384 or email pauldavis5322@comcast.net. From left, are Jonathan Stewart, Vietnam veteran; Nena Stewart, U.S. Army veteran; Jason Stewart, newly appointed Delaware Veterans Coalition Kent County representative; and Dave Skocik and Paul Davis. Mr. Skocik and Mr. Davis serve as coalition president and vice president, respectively. 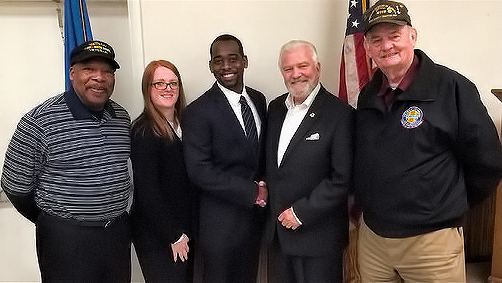 At its Jan. 30 meeting, the Delaware Veterans Coalition appointed Jason Stewart as its Kent County representative. Mr. Stewart, a U.S. Army veteran who served in Iraq, lives in Camden and is a medical program student at Delaware Technical College’s Owens Campus. He is past president of the college’s Veterans Inspiring Progress, a nationally recognized student veteran organization formed to provide military veterans and services members with the resources, support, and advocacy needed to succeed in higher education and subsequent employment. It is open to every veteran and service member, including the National Guard. “We welcome Jason to the Coalition. His experience, training and dedication will be tremendous assets as we continue our outreach to all generations of the state’s veterans, including active duty, National Guard, recently discharged, and retired,” said Coalition President Dave Skocik. The coalition is a statewide, non-profit, 501(c)(3) lobbying organization that advocates with elected and appointed public officials on issues that affect all generations of Delaware veterans. Membership is open to all honorably discharged veterans residing in Delaware. Meetings are open to veterans regardless of membership. In the presence of representatives from the Commission of Veterans Affairs, legislators and veteran organizational representatives, Gov. 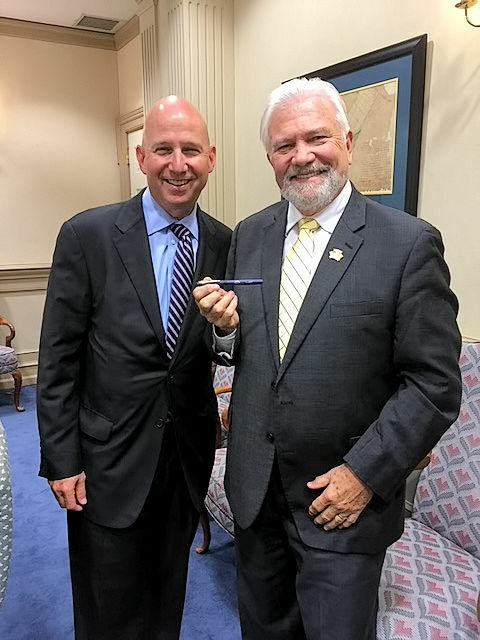 Jack Markell signed HB 80, aka the Stolen Valor Act, into law on Tuesday, August 9, 2016. The Delaware Veterans Coalition communicated its support for the bill to every legislator prior to the vote. Dave Skocik, president of the Veterans Coalition, with Gov. Markell displaying a pen used to sign the bill. Victory Village has opened its doors to veterans in Middletown, Delaware. The property, which can house up to 30 male homeless veterans and provide service for many more, is a project of the National Veterans Assistance Coalition. NVAC is a dedicated professional group of staff and volunteers focused on helping veterans receive the benefits and services they have justifiably earned and to provide housing and support services that enhance their personal and professional development. The center will be a one stop Veterans resource center, including those transitioning back from military life. They are partnering with schools to offer training, including a woodworking shop, auto mechanics, and computer programming. Training will also include resume writing training and help preparing for interviews. Counseling and social workers will also be available through local resource agencies. 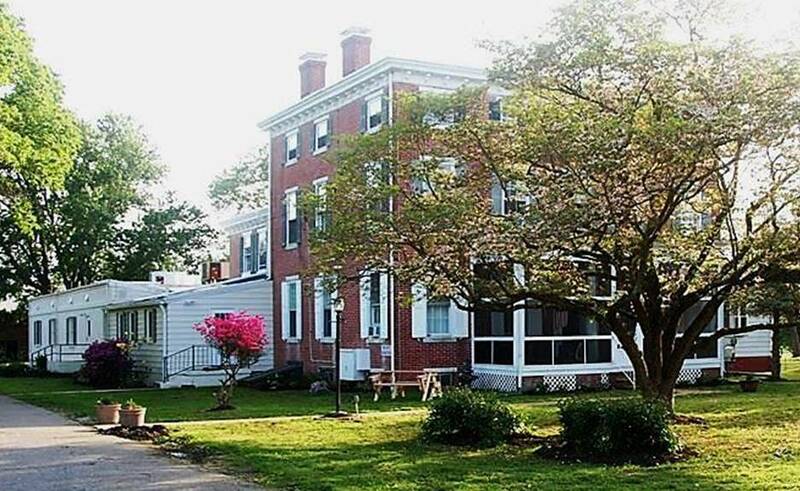 “The Center is located in a 175-year-old mansion at 554 Port Penn Road, Middletown, that has a long and rich history of providing housing and life enhancing services. After a complete renovation of the building and grounds, the Center is proud to open its doors to our veterans,” said founding member Rick Hagar. The project began in March 2014 and will be a national model, according to Mr. Hagar who, along with co-founder Tyler Andrews also operates four homes in North Carolina. They have been invited by representatives from various cities around the country to talk about their program and the potential of open homes. Potential sites include Maryland, Pennsylvania, Virginia, Florida, Arizona, and plans are already under way to open a second home in Delaware. 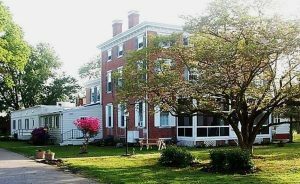 Future development plans include converting the caretaker’s home behind the facility to house as many as a dozen female residents. Visit www.NationalVAC.org for more information or call 302-832-5790 or email support@NationalVAC.org.